There are rare and fantastic days when you can drop in from wherever you call home and be transported to bird hunting bliss set in a stunning landscape. Whether it’s the North Woods, a vast prairie or a Western canyon, that transformation from the everyday places of our lives draws us to the joys of traveling to hunt. The privilege of such a transformation struck me late in the final morning of my early December visit to the Flying B Ranch, in north-central Idaho. My guide, Arby Shown, had brought me by an inspiringly precipitous mountain road above the ranch to hunt a far finger of land overlooking Lawyer Canyon. We stood on the edge of the finger, itself on the edge of miles of harvested, rolling wheatfields, while Arby’s setter Charlotte covered the surrounding grass and scrub for the scent of wild Huns. Hundreds of feet below, around the bends of a twisting coulee, lay the Flying B’s 5,000 acres, defined by Lawyer Canyon and the six miles of Lawyer Creek at its core. The temperature was in the upper 20s, and the rock outcroppings and firs stood out in a fine snow that had fallen the night before. The landscape was vast and dramatic, but this pocket of it held no Huns that Charlotte could conjure. So be it. We knew that there were plenty of pheasants, chukar, quail and Huns in the varied terrain of the preserve lands and steppes below us. I considered the sweeping panorama blessing enough. Arby pointed out the distant spot where he’d grown up hunting and fishing and described the view beheld by Lewis and Clark and their Corps of Discovery when they’d reached this point on their return trip from the coast. He told the story of a turkey hunt in the pockets of timber on the slope across from us as we watched a band of whitetails move off slowly far down the draw. I could not have felt much further from life in the office or from the dense Maine woods of home. Sign up for the newsletter: the best of Shooting Sportsman. 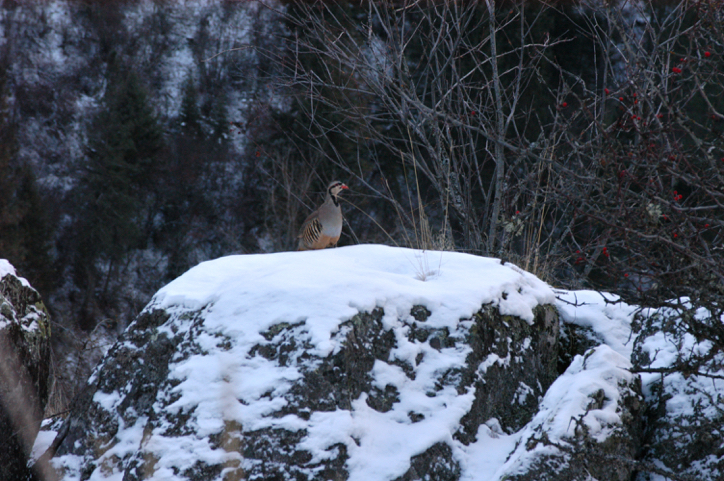 We already had found plenty of birds throughout the canyon—mostly pheasants and chukar on the brushy flats along the creek bed and on the rocky plateaus and slopes. One reason, surely, that the Flying B has been named 2014’s Orvis Wingshooting Lodge of the Year is its huge variety of terrain and wingshooting opportunities. Guests can walk as little or as much as they want over easy, level ground, moderately difficult sidehills, or rugged forest and brushy canyon slopes. Several areas offer well-managed preserve-style shooting, and there are no limits on the put-and-take species. The periphery of the property is a bit more rugged, making the hunting feel much closer to wild. On my first afternoon at the ranch I followed along with my camera as 16-year-veteran-guide Rich Coe and a couple of German shorthairs led Dan and Carrie Clark—a father and daughter from Orange County, California—over a rocky slope above the creek. On the ride to the hunting area in the ranch truck, Dan had told me that he’d brought all three of his children to the Flying B to learn to shoot and hunt. Carrie was there on what has become an annual visit, and it was Dan’s third visit of the year. The ranch and the staff engender that kind of loyalty. The Clarks enjoyed good-natured ribbing back and forth with Rich about their shooting and his dogs and guiding. But the joking was just good fun: The Clarks shot well, and Rich worked the GSPs with solid control. 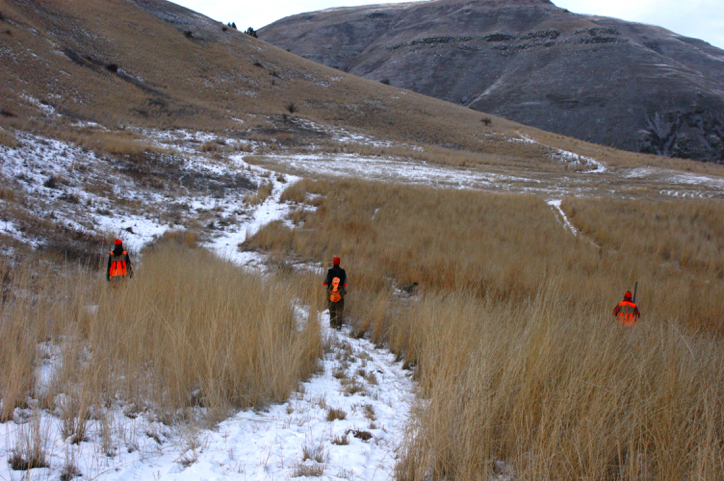 It was a pleasure to see the father and daughter enjoy dozens of opportunities for pheasants, chukar and Huns, walking in on points with a safe but enthusiastic urgency. The birds flew strongly and sometimes didn’t wait, and on the sloping terrain amid brush and boulders, the shooting was often as challenging as it was frequent. My photo journal shows birds beelining away, birds holding in dense cover, and a few that eluded one shooter and presented high crossing shots to the other, downslope. The Clarks shot about a dozen chukar in the afternoon and half as many each of pheasants and Huns, bringing their daily bag to 59 birds. Dan Clark’s long-running enjoyment of the Flying B impressed me, because he has traveled extensively to shoot and seems to know a good thing when he’s found it. He told me that he goes on five or six “put-and-take” wingshoots a year, hunts wild birds less, and annually travels to Sonora, Mexico, to shoot doves with a family he has been visiting there since first meeting them with his own father when he was young. At the Flying B he was shooting a 20-gauge Model 21, a gun he has shot since the early ’60s. Over dinner that night he told me that he knows he could carry a fancier gun but that he prefers to spend his money on shooting experiences. My two days hunting with Arby provided variety that belied the scope of even 5,000 acres. We started my first morning with his setter Charlotte and a shorthair from the Flying B’s kennel in a bird-rich area of flats along Lawyer Creek. It was a great warm-up on a chilly morning, and I took plenty of time to focus on mounting my 20-gauge over/under and getting my head down as the muzzles caught up along each bird’s flight path. 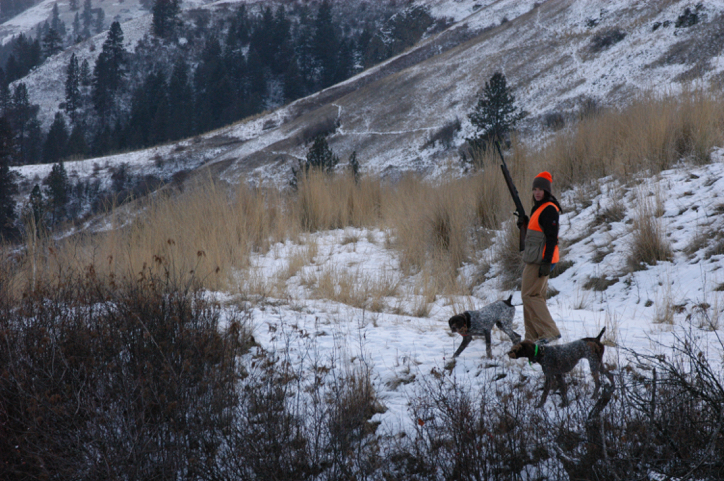 We found mostly pheasants and a few chukar, and all were strong fliers. More than a few eluded my patterns and flew several hundred yards to the relative safety of the forested slopes at the base of the canyon’s walls. 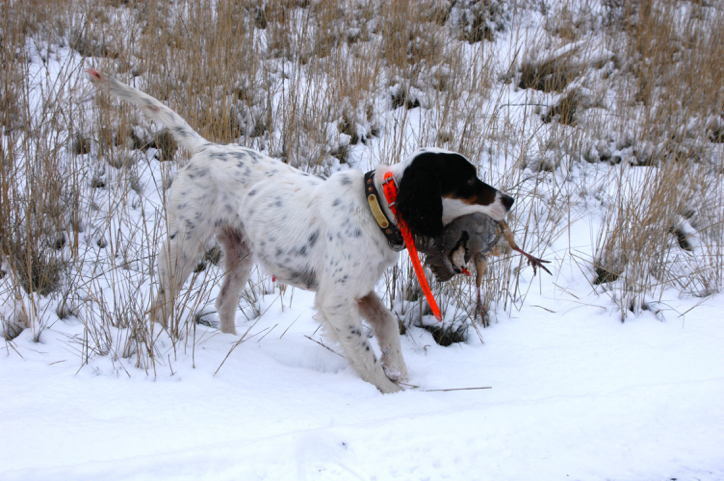 Arby had an easy-going way with the dogs and the pace of the hunt, qualities much appreciated in a bird-hunting guide. Once he saw that I was safe in the field and a reasonable shot, we settled into a calm and thoroughly enjoyable morning, chatting about the dogs, the cover and the privilege of the day while ambling from point to point. In the afternoon we hunted farther down the creek, then, by my request, headed into the brush and forest of the slope above us for a chance at wild birds—ruffed and blue grouse. Some snowy sidehilling and bushwhacking and the prospect of challenging and explosive flushes had my full attention in this more rigorous pursuit, but the grouse eluded us. 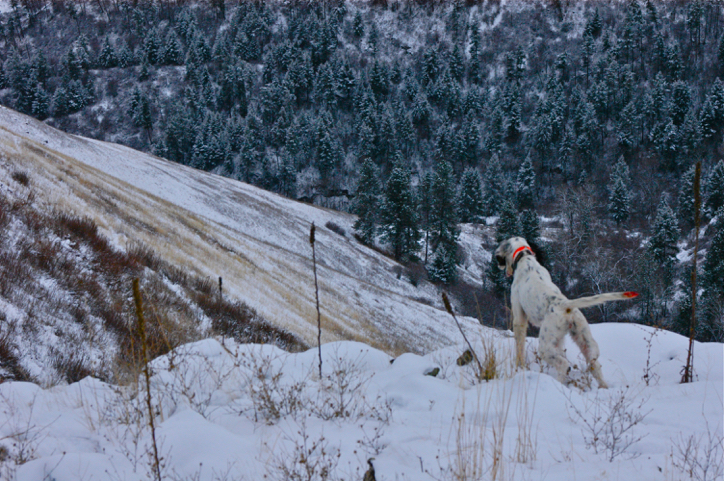 Still, the dogs picked up the scent of so many pheasants and chukar as we crisscrossed back down the lower slopes that my bag went past 20 birds, and the combination of such success with the effort of wild-bird hunting provided satisfaction, fun shooting and heavy vests. The second morning dawned with several inches of fresh snow, and Arby was excited that fellow guide Jeremi Syron had cut the fresh track of a mountain lion near the edge of the ranch. 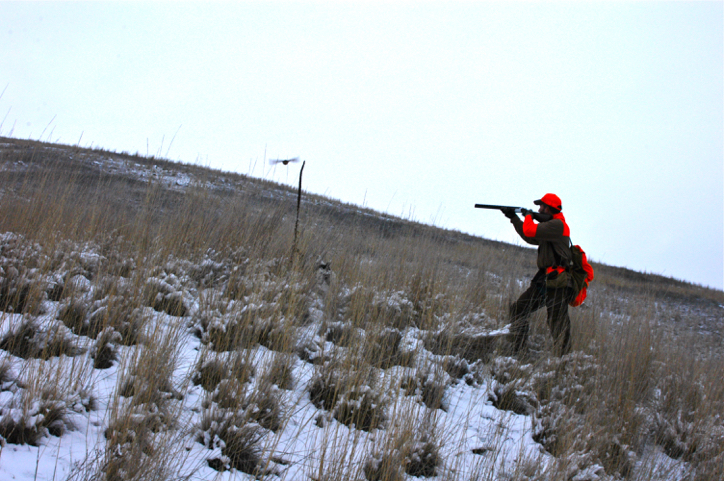 (The Flying B offers a lot of big-game hunting, typically on National Forest land.) Was I game for a lion hunt? You bet, as I was curious to see how the hounds and the hunt would go. We had no real intention of shooting a cat, but the dogs needed work, and the chance to see a lion treed spurred us on. We met Jeremi and a pair of hounds in a forested draw on the canyon’s south slope, where the cat’s huge paws had left telltale sign across a narrow two-track. Amid our preparations and the guides’ quick formation of a strategy, Arby told me of a past lion hunt when the trail showed signs of a leap and then disappeared. Puzzled, he found the trail again by process of elimination: 17 feet straight up where the cat had landed and proceeded on from a rock outcropping. This anecdote had me looking up frequently for the next hour. The hounds led us down a steep ravine, across a frozen stream, and then up a ridge, bushwhacking through forest and crossing glades as we climbed. My companions were modern mountain men in every sense—incredibly strong and accustomed to the chase. I’ll admit that I lagged behind some, though I pushed hard to stay within a reasonable distance. The ridge where Jeremi and I rested dropped into a steep defile—so steep that the rangeland on the far side was in plain view but the bottom of the draw was out of sight. Arby followed the hounds over and down and was climbing the far side when he radioed Jeremi that the lion was heading off of ranch property. It had been a brief and exciting pursuit, but, with my pulse returning to normal, I was hardly crestfallen to be heading back down. I viewed the afternoon chasing birds on the creek flat and adjoining sidehills from an entirely new perspective. Lawyer Canyon, named for a Nez Perce chief, has a rich history filled with explorers and settlers, and you can read about it on the Flying B’s excellent website. The creek bottom was reshaped by a flood in the winter of 1996-’97, and the resulting recovery strategy shifted away from active farming and toward habitat restoration. The results are still in the making, with seedlings coming up where large cottonwoods formerly lined the creek flats. But the effort represents the same long view that explains the longevity of so much of the ranch staff, with a focus on the sporting guests and improving the land. On the last afternoon I encouraged Arby to carry a shotgun and do some shooting so that I could get a few more photos, and I was pleased that he accepted. He carried a nice little CZ 28-gauge over/under, and of course he shot it well. The gun had been a present from his wife, and he said that this was his first time shooting it in the field. We tallied 20 more birds between us. Also unusual was that I was visiting at a relatively quiet time, and although the Flying B fairly buzzes year-round, I had the place practically to myself. I did enjoy the one afternoon afield and a few meals with the Clarks, but on my last night I was by my lonesome in the 14,000-square-foot, 14-guest-room main lodge. Even better, I didn’t have to share the tray of hors d’oeuvres—chukar and strips of jalapeno broiled in a bacon wrapper. The lodge offers everything you would expect at a top-tier destination. It is on the comfortable side of rustic luxury, with a soaring, two-story great room featuring a restored antique bar along one wall, a huge stone fireplace, soft leather couches, art and taxidermy. The staff could not be more gracious or helpful. The first floor also holds an open bar and game room, a large-screen TV area, a well-stocked pro shop and a very nice locker room for guns and gear. My bedroom was large and nicely furnished, with a full bath and a sliding door to a deck with views of the canyon. The kitchen—the soul of a hunting lodge—was all that I expected and then some. Head chef (and fishing guide) Ryan Nelson was a one-man show during my stay. Another Idaho native, Ryan has been with the Flying B since 2005 and has perfected a repertoire that is strong on wild game, like the chukar appetizer. I feasted on pheasant cordon bleu with prosciutto and Gruyere on a bed of stock-enhanced rice for lunch; another midday meal was an exceptional wild-boar stew. Dinners included hazelnut-crusted halibut; tender and flavorful Wagyu beef filets with hearty mashed potatoes and green beans followed by crème brûlée and local berries; and my favorite: lamb shanks braised in pheasant stock with potato gnocchi. Arby joined me for dinner the last evening, and we talked easily, sharing hunting and fishing stories. He has a lot more stories than I do. He was in his seventh year of full-time, year-round work for the Flying B, where he guides hound hunts for bears and mountain lions, spot & stalk bear hunts, and turkey hunts, as well as helps run the lodge’s backcountry fishing camp, which is a 90-minute horseback trip through a high pass. 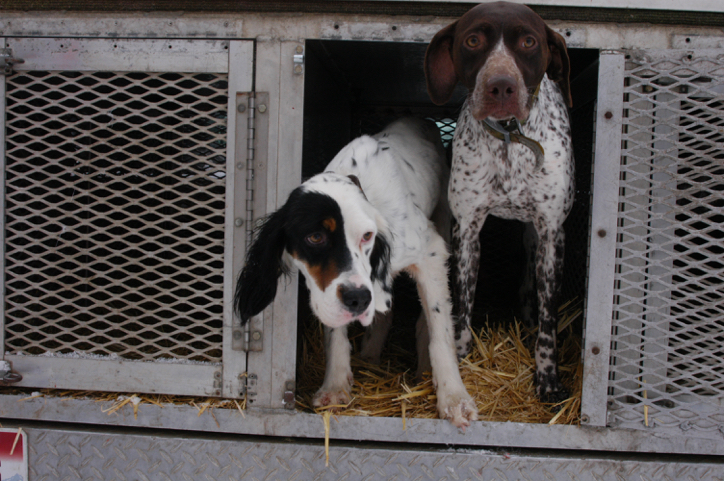 He also works with the ranch’s extensive kennel of primarily GSPs and pointers, and he does maintenance and habitat work when the season calls for those. Because of the amount of big-game guiding he does, Arby said he doesn’t get as much bird hunting as other guides. “I probably still get in 50 or 60 days a year, though,” he said. After that last dinner, I stood outside and took in the huge inverted bowl of stars above the dark shapes and shadows of the canyon walls. You can travel to hunt in many places around the world, and I’ve been blessed to see some great ones. I’ve found that the best trips will have some mix of great birds, interesting landscapes, quality dogs, good food and drink, and comfortable lodging. But the most memorable experiences will come from the people you find there—and the people of the Flying B are among the best I’ve met in the field. The ranch offers the total package, but the genuine enthusiasm of the staff contributes mightily to the experience and I’m sure figured into the Lodge of the Year award. In fact, it was the second time the Flying B had received the award, and it is testament to their enthusiasm for the place and their team that many of the current staff and guides were already seasoned veterans at the Flying B when it received the first award, in 2003. 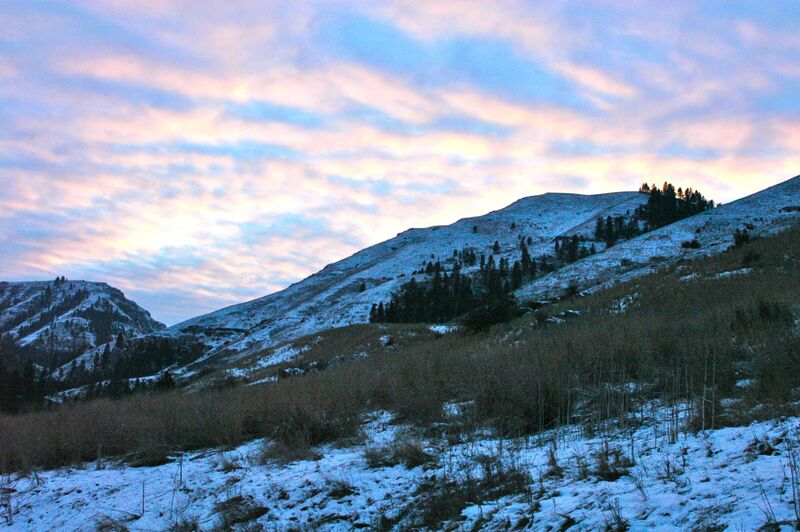 My few days in Lawyer Canyon were some of the shortest days of the year, with colder-than-average temperatures and more snow than in recent history. But I wouldn’t hesitate at the chance to hunt there again at the exact same time. The trip was that satisfying. Wingshooting is available from mid-August to mid-April, so there are plenty of options should my chance for a few more rare and fantastic days come. Join us for an upcoming hunt at Flying B Ranch. Author’s Note: For more information, contact the Flying B Ranch, 800-472-1945; www.flyingbhunting.com. Ed Carroll is Shooting Sportsman’s Associate Editor.